A joined-up operation between Brent Council, the Police, Veolia and Ashford Place, the homeless charity in Cricklewood, will see the first night operation taking place at Gladstone Park from tonight. The aim of the operation is to decrease anti-social behaviour and remove any tents and structures that may be up in the park. There has been a reported increase of people sleeping in the park using tents and other bedding and this contravenes park bye-laws. The majority of those sleeping in the parks have come from Romania to seek work in the UK and send money home. We understand they are trying to avoid accommodation costs by sleeping in the park. Whilst sympathetic to these individuals, Brent Council’s primary concern is the safety of its residents. 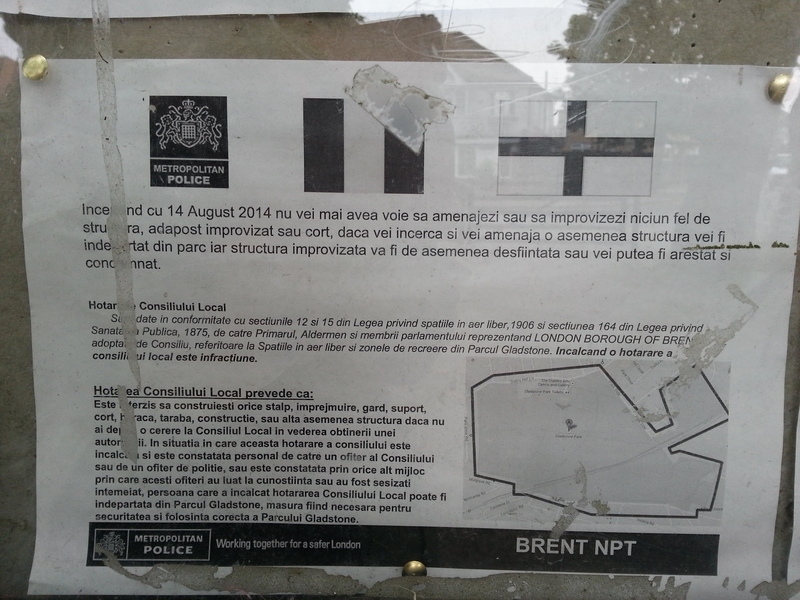 Signs are already up at the park in both English and in Romanian. Brent Council has been made aware that many of these people are also seeking employment at the informal labour market in Chichele Road, Cricklewood. The Metropolitan Police have implemented a dispersal zone to deal with this problem, and any employers hiring staff this way will be questioned by the Police. We would also discourage residents from hiring them for casual labour, as we believe this is exacerbating the problem in the parks. If you are not sure of someone’s status, ask for an NI number when hiring them, so you can be sure they have a residential address and paying taxes in the UK. Brent Council is also working with the HMRC and UKBA to establish the immigration status of these sleepers. 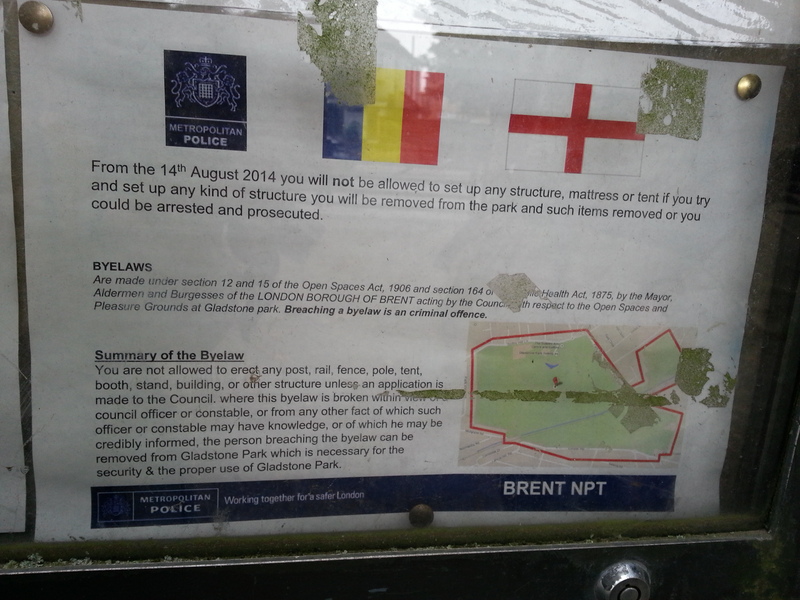 Posted on September 11, 2014 September 10, 2014 by Cllr Krupesh HiraniPosted in Crime, Dudden HillTagged Ashford Place, Brent, Brent Police, Gladstone Park, Police, Rough Sleeping, Veolia.